Target Revolver started at Headley Park because a few of us had recently bought double action nitro revolvers and we wanted to shoot them competitively. As these pistols cannot really compete on equal terms with LBRs but are perhaps too modern and reliable to compete with historic cap and ball – we felt we needed a new discipline. We also wanted to shoot stages against the clock, so that scoring would require both accuracy and speed. We shoot a variety of stages, some paper some reactive. We aim to get through 6 stages on the day, depending on the number of shooters, weather and time available. Stages are usually only 6 rounds, so it’s a cheap day out. .
We run a shoot on the 25 yard range on (usually) the first Saturday of the month. But please check the calendar for dates. We aim to start at around 12pm, sometimes slightly later depending on how long it takes us to set up the targets. 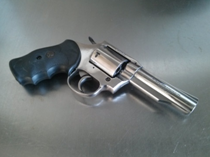 What kind of revolver can I use? We welcome all revolver owners, LBRs, Traditional Cap N Ball, Nitro conversions bring whatever you have. Although our main focus is on double action nitro revolvers, we are happy for anyone to come along and have a go. We run a classification system so you will be shooting against equals. Nothing – it’s free for all members of the club.